Sunset limousines have been providing an unbeatable limousine hire service in and around Yorkshire for over 20 years. Over this time we have developed a wealth of experience in all areas of the industry and are confident that we will provide a five-star chauffeur driven limousine hire service at all times. We are experts in providing limousine hire for all special occasions and specialise in providing chauffeur driven transport for weddings. Utilise our service and we will ensure that your driver and vehicle arrives on time and looking immaculate ready for your big day. We take extra care in ensuring that you reach your destination on time, relaxed and in style. Using our wedding limousine rental service is stress-free and simple. We will collect you from your chosen location, take you your wedding venue, and if you like we can collect you afterwards to chauffeur you to your next destination too. If you’d like some champagne to enjoy during the ride, we can throw that in too. You will receive the best possible service from initially booking your limo, to being waved off at your final destination. Contact Sunset Limousines by calling 0113 229 2002 or 07973 782 955, or by completing our enquiry form for your limousine hire quote today. It’s your big day, so no matter what you require contact the team at Sunset Limousines, we’d be honoured to help. Our limousines are Lincoln Town Cars and are available in black or white. Our vehicles and drivers are always presented immaculately so that you and your wedding party can arrive and depart your wedding venue in style. 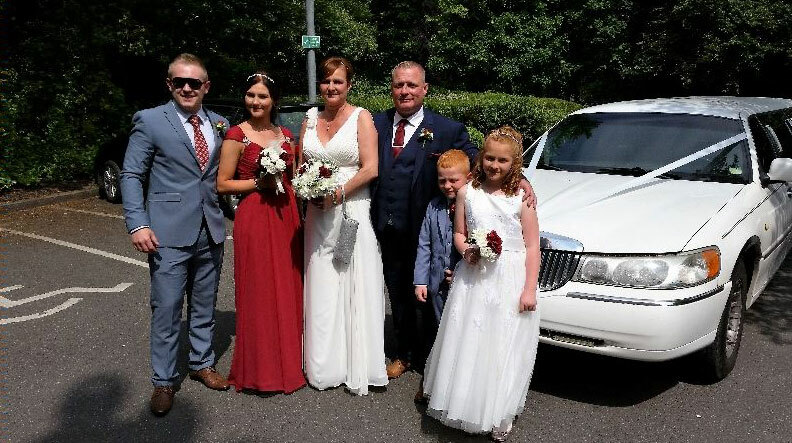 If you don’t want a limousine for yourself but would like to spoil someone you care about with a limousine on their wedding day, contact Sunset Limousines and let us help you to make someone else’s big day extra special. Having your wedding in or around Leeds? Hire Sunset Limousines for a first-class chauffeur service on your special day. Or if you are having a hen or stag night-out, you can hire one of our stylish chauffeur-driven limousines for that too! All of our vehicles come fully loaded with the latest technology, including television and music. Our limousines also feature a full-length bar for your convenience. Sunset Limousines provides a five-star chauffeur driven limousine hire in Leeds and the surrounding areas of Yorkshire at competitive prices. If you require a chauffeur driven limousine for a wedding, hen or stag night out, birthday or prom, contact the team at Sunset Limousines today.